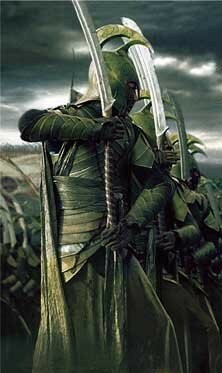 Today I have been thinking a lot about elves (as in the Lord of the Rings sense). Elves always seemed to me (and deliberately intended to be so by Tolkien) to be the most graceful and beautiful of the races of Middle Earth. As most people know, the undertaking of three Lord of the Rings films was a phenomenal effort, with attention paid to every detail, to create a world that was totally immersive and self consistent. As there was a lot of fighting in the books/films, care was taken to ensure that all of the different characters and races had "accurate" fighting styles to match their physiques, temperament and cultural sensibilities of their respective races. So I started to wonder what are the martial arts techniques that the elves use? SFI: What martial arts styles did you draw from in developing the fighting arts of the Elves? And are there other examples we see in LOTR? TW: The design process was not really a matter of borrowing techniques from real-world fighting styles. Having determined a series of very specific "key points" about a given character type's posture, weapons, armour, tactics and so-on, the techniques essentially created themselves. SFI: What key points did you define for the Elves, and what other examples of techniques arose from those points? TW: It's great that martial arts-oriented viewers seem to latch on to the Elves. Basically, the Elves were beautiful. Every aspect of their culture reflected a refined sense of aesthetic beauty and wonderment. They were completely attuned to their environments. It followed that, as warriors, they would be superbly balanced — grounded from the waist down, light and free from the waist up. Although they were capable of linear movement, their style was based on a spiraling action — circular, gliding footwork patterns, deflections rather than blocks, slices rather than thrusts or strikes. Also, because they are immortal, they've spent decades or even centuries perfecting their martial arts — they can do things that human swordmasters could only dream of. What does that remind you of? Pretty clearly tai chi (and chinese martial arts) to my mind as that description ("grounded from the waist down, light and free from the waist up....based on a spiraling action") is almost the exact definition of the tai chi principles. To paraphrase the rest of the interview, the humans had styles derived from Western mediaeval techniques. Dwarfs were almost sumo like and all about power, whilst the orcs were corrupted, angular and out of balance versions of all three. Clearly then, if you want to emulate the gracefulness of an elf from Lord of the Rings, best start practising tai chi.